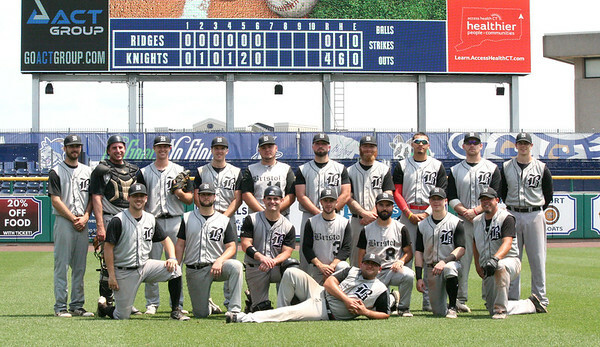 The Bristol Knights, with an 18-7-1 regular season record, have won the Central Division of the Connecticut Twilight League and are the No. 2 overall seed in the CTL playoffs. The Knights start postseason play today against the No. 3-seed PLAT Life Royals of East Hampton at Mount Nebo Field in Manchester today at 6 p.m. in the double-elimination CTL playoffs. The two last teams alive after double-elimination play will play a best-of-3 series at Muzzy Field next week, with the first two games on Aug. 15 and the last contest, if necessary, on Aug. 16. The Knights have jelled around a mix of talented veterans nearing the end of their baseball days, some in the prime of their baseball years and some younger players starting to take charge and lead the team. On the mound, the team had multiple pitchers with fantastic seasons. Nick Dzioba’s 0.37 ERA is near the top in the league and has been all year long. He also finished with a 3-1 record, in 38 innings pitched. Rick Barrett went 6-0 on the season with a 1.75 ERA. Knights newcomer Neil Kozikowski came in midseason and had an immediate impact, sporting a 5-1 record, a 1.48 ERA and 56 strikeouts in 33 innings pitched. The Knights’ long-time starter and ace Chris McGrath had a bit of a down year statistically, but has looked great all year long and will be leaned upon once again in the playoffs. The Knights’ outfield defense has been amazing, led by a combination of Kyle Lentini, Julio Oritz-Rivera, rookie Georgie Santiago and Steve Clout. The infield defense has been anchored by Knights veterans Tommy Stagis, Rick Barrett and Marco Ross. Knights rookie catcher Justin Martella has been a strong stabilizing force behind the plate in most games, especially without some long-time veteran catchers being available in 2018. The team has had a much better offensive year collectively, batting .301 as a team while also leading the league in runs scored (149) and finishing second in fewest allowed (75). The offense has been spread pretty evenly throughout the lineup, although two players at the top of the order have had incredible seasons. Ortiz-Rivera (.350 avg., 21 runs, 12 walks, 21 hits, 2 HR, 8 RBI) and Rex Cone (.239 avg., 9 runs, 10 RBI). Cone had his best year ever in his sixth with the Knights. Santiago led the league in many categories at many points throughout the year, finishing the regular season batting .407 with 12 stolen bases, 24 hits, 18 runs, and nine RBI. Many long-time Knights are having strong seasons at the plate. Barrett (.327 avg., 14 runs, 8 RBI), defending CTL MVP Lentini (.333 avg., 8 runs, 6 RBI), Ross (.292 avg., 7 runs, 12 RBI), Clout (.282 avg., 6 runs, 8 RBI), Stagis (.368 avg., 7 runs, 9 RBI) and Cone (.239 avg., 9 runs, 10 RBI) all made big contributions. Two other Knights rookies also had outstanding debuts with the team as well. Martella hit .295 with a team-leading 14 RBI. Midseason acquisition and Bristol native Kyle Pileski make a strong mark right away and finished the year batting .370 with eight runs and 10 RBI. The team is looking to win its fifth Connecticut Twilight League championship in only its 16th season. Posted in The Bristol Press, General Sports on Tuesday, 7 August 2018 20:32. Updated: Tuesday, 7 August 2018 20:34.